So the Apple event with “a little more to show” us is now over and apart from the surprising iPad 4 announcement we got the iPad Mini too. This little iPad has a 7.9-inch display with a resolution of 1024 x 768 giving you the same resolution as the iPad 2 on a smaller screen. Other features packed into the iPad Mini include an A5 dual-core processor; this is again the same spec as the iPad 2 so you can expect a decent app performance. The tiny dimensions of the iPad Mini are 200 x 134.7 x 7.2mm and it weighs in at a teeny 308g and that high resolution screen delivers a greater portion of web pages and screen detail than other 7-inch screen devices. The iPad Mini will be available in a 4G version and thankfully for UK users it will support the 1800MHz frequency so you will be able to truly experience 4G with the likes of the EE network with this device. The camera on the rear has a 5-megapixel resolution and 1080p HD video recording, there isn’t a built-in flash but the sensor has backside illumination to help in low light conditions. The front facing camera is 1.2-megapixels for use with FaceTime and Wi-Fi and Bluetooth are on board. The battery gives up to 10 hours of usage and the iPad Mini sports the Lightning connector so if you have any existing accessories you will need to get an adaptor to use them with this latest little iPad. The pricing came in at a little more than expected (but we never really thought an iPad would be cheap) with the 16GB Wi-Fi version going for £269 making this the lowest priced iPad yet. The mobile version costs more with the starter 16Gb model costing £369 and these latest iPad Mini versions will be hitting the shops on November 2nd. 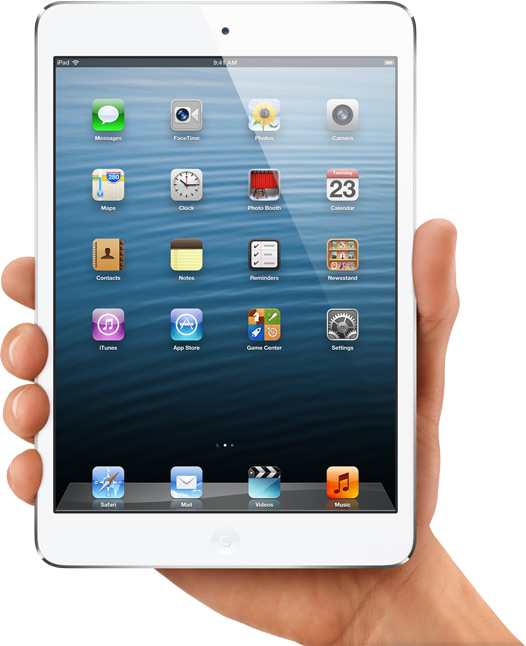 So what do you think of the iPad Mini? Will you buy one? Nexus 7 has Quad Core for outstanding app performance…..